Christopher Herrick’s ongoing tour of the world’s greatest organs gives rise here to a truly glorious disc from Canada. The 96-stop, 6,551-pipe 2002 Letourneau organ of The Winspear Centre, Edmonton, Canada—a veritable beast of an instrument, described by Herrick as ‘terrific … fantastic … a very fine instrument’—produces a sound which is, in every sense, awesome. Hyperion’s engineers have captured the pyrotechnics in all their devastating glory. The programme is varied, starting with an unashamedly jazzy Blues-Toccata and Behnke’s version of the South African ‘freedom song’ We are marching in the light of God, progressing through works by Mulet, Johnson, Duruflé and Bonnet, to movements from Iain Farrington’s Fiesta!, written for Herrick’s sixtieth birthday celebrations last year. Crowning proceedings is Liszt’s epic Fantasia and Fugue on ‘Ad nos, ad salutarem undam’, a half-hour extemporization on Meyerbeer’s theme and one of those organ works which finally won for the instrument a place of its own in the musical firmament, finally emancipated from the church loft and taking centre-stage on the concert platform. For John Rutter’s Variations on an Easter Theme, Herrick is joined by the Canadian organist Jeremy Spurgeon, here making his debut on Hyperion. Based in Stavanger, Norway, Mons Leidvin Takle (born 1942) is an organist-composer who studied in Stockholm, Copenhagen, Chicago and New York. His jazz-inspired Blues-Toccata is based almost entirely on the material heard in the first four bars, i.e., the brilliant semiquavers in the right hand, and the punchy, rhythmic chords (mostly sevenths and ninths) given to the left hand and pedals. Particularly ‘bluesy’ is the way in which the right-hand figuration alternates between minor and major, and, in much the same way that the members of a jazz ensemble have their ‘breaks’, here the pedals get an occasional share of the semiquavers, as does the left hand; but the brilliant right-hand part steals the show. The animation steadily increases, the pedals have a brief cadenza, and the end is a riot, with dominant sevenths in F major and G major simultaneously sustained over a pedal octave C.
Siyahamba, which is subtitled ‘We are marching in the light of God’ and based on a South African freedom song, is the first of the Three Global Songs of John A Behnke (born 1953), a professor at Concordia University in Wisconsin, USA. The repeated and sometimes syncopated chords which are heard at the outset introduce ‘Stanza One’, a jaunty first statement of the theme. An ‘Interlude’ then leads to a robust further statement, in which the pedals are heard for the first time and the theme is nobly declaimed on a trumpet stop. At the second ‘Interlude’, the music abruptly switches from the solidity of G major to the sparkle of the remote key of A major, and a passage similar to that heard initially introduces the final ‘Stanza’, which is marked fortissimo and A bit slower, more majestic. The repeated chords’ return make one think that the music is dancing into the dim distance, but the composer surprises us. Henri Mulet (1878–1967) was Organist at St-Roch, Paris, and Professor of Organ at l’École Niedermeyer. He was one of the more enigmatic figures of French organ music, so much so that his collection Esquisses Byzantines, published in 1920, gives no information about any appointment held by him and instead of bearing a dedication to a fellow musician is inscribed: ‘En mémoire de la Basilique du Sacré-Coeur de Montmartre 1914–1919’. Tu es petra et portae inferi non praevalebunt adversus te (‘You are the rock and the gates of hell shall not prevail against you’) is the tenth and final piece in this collection, the title itself being a corruption of the Vulgate version of the words of Christ to St Peter in St Matthew’s gospel, chapter 16, verse 18. Mulet described the piece, in its separately published form, as carillon, but it is more helpful to think of it as a fairly typical example of a French organ toccata, with scintillating figuration on the manuals accompanying sinister-sounding motifs given out by the pedals. The final pages are among the most exciting in the organist’s repertoire. O sons and daughters, let us sing! O’er death today rose triumphing. The work was given its first performance, by Ray and Beth Chenault (to whom it is dedicated), on 31 July 1983, at Washington National Cathedral, USA. Rutter’s title suggests something a little ‘churchy’, yet the music has much in common with the other works in this programme, especially the toccata-like figuration of the faster variations and the ‘bluesy’ harmony of the slow ones. Composers of organ music have tended to highlight the instrument’s more colourful stops, and the trumpet has naturally enough been much favoured ever since the Basse de Trompette movements of French organ masses and those movements from the voluntaries of John Stanley and his contemporaries that make a feature of it. By the twentieth century, the mildly voiced trumpets of the eighteenth-century organ had to a large extent been brushed aside by heavy-pressure examples, and Norman Cocker and C S Lang were among those British organist-composers who wrote ‘tuba tunes’ – that is, movements exploiting the commanding sonority of the most powerful voice in the organ’s family of trumpets. David N Johnson (1922–1988), an American composer who wrote prolifically for the organ, is nowadays best remembered for his own contributions to this repertoire, of which the present work, Trumpet Tune in G, is a fine example. The swagger and stateliness of this music, its framework of eight-bar phrases, and the occasional ornament all owe something to the ceremonial music of the Baroque period, which was obviously Johnson’s starting point; but the added-note harmony proclaims immediately the hand of a twentieth-century composer. In this recording, a cornet registration is used for the C major central section, making the re-introduction of the fine trumpet stop all the more telling. Like Mulet, Maurice Duruflé (1902–1986) was a Parisian organist, presiding at St-Etienne-du-Mont from 1930 until his death. Born at Louviers, near Paris, his training began at Rouen Cathedral and continued at the Paris Conservatoire, where he studied composition with Paul Dukas, to whom he dedicated his Suite, Op 5, which dates from around 1934. The Toccata, the third and final movement of the Suite, stands apart from the rest of the work and indeed from the rest of Duruflé’s small but immensely distinguished output. There is nothing here either of the sombre beauty of the Prélude, the first movement, or of the exalted tranquillity of the lovely Sicilienne, the second; and although it has a certain amount in common with Mulet’s Tu es petra, it explores to a much greater extent not only the resources of a large organ but also the tonal, textural and harmonic resources of music. In fact, it has more to do with the pianism of Ravel and Debussy than with the traditions of the French organ-loft, for there is no trace of Gregorian chant or Bachian polyphony in this terrifying cascade of virtuoso figuration. At various points the fury subsides a little, but the work as a whole is, for all its brilliance, dark and disturbing, and one wonders whether Duruflé’s eventual refusal to play or record it reflected origins in some deeply troubling personal experience. Joseph Bonnet (1884–1944) is the third Parisian organist in this programme. Born in Bordeaux, he entered the Paris Conservatoire in 1901 and gained the Premier Prix for organ and improvisation in 1906, in which year he was appointed Organist of St-Eustache and of the Société des Concerts du Conservatoire. He was, also, a much-travelled recitalist, abandoning the organ-loft in order to undertake recital tours. The present work, Matin Provençal, is the second of his Poèmes d’Automne, Op 3, a collection dating from around 1908. At the outset, flutes’ gentle figuration suggests the play of light upon water, and a modal melody, played on the oboe and based on the flute music, sets the rural scene. The oboe tune is developed, much use being made of the repeated notes in its first bar; chromatic notes invade the modal calm; the music becomes increasingly animated; and, as the sun rises to its zenith, the resources of the organ are gradually brought into play. The oboe tune is heard, Maestoso, on full organ, and Bonnet’s magical evocation concludes with the transformation of the flutes’ opening notes into a toccata suggestive of morning ending in a fiery blaze of noon. Educated at St John’s College, Cambridge, where he was Organ Scholar, Iain Farrington (born 1977) is among the leading organist-composers of his generation. Celebration and Stride Dance are respectively the first and third numbers of Fiesta!, a seven-movement suite for organ. Celebration, written in 2002 to mark Christopher Herrick’s sixtieth birthday, is a lively, toccata-like work drawing inspiration from the modern French school of organ composition and displaying a dazzling rhythmic style and a remarkably rich harmonic palette. The key of C major, which is suggested at various points, is thrillingly confirmed by the final pedal notes and the added-sixth chord which brings the work to its close. Whoever is dancing in Stride Dance is a sinister, feral creature slinking about in the gloomy shadows of F minor. The right hand’s syncopated chords are the chief protagonist here, the pedals and left hand providing a hesitant, off-beat accompaniment. The music increases in confidence and intensity, the opening F minor figure appearing in a number of major-key guises; but with that key the work disturbingly ends, the final sound comprising the basic ingredients of a tonic chord but with the sharpened fourth, sixth and seventh degrees added for good measure. 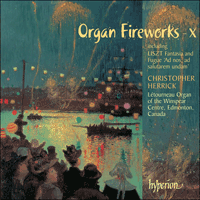 Thus far, this tenth volume of Organ Fireworks has concentrated on music in the twentieth and present centuries and in particular on toccatas and on jazz-inspired works. Christopher Herrick concludes with a work written in the nineteenth century and which he considers the finest post-Bach contribution to the literature of the organ. In the 1850s, inspired by the interest in J S Bach that was so much a feature of music in nineteenth-century Europe, Franz Liszt (1811–1886) wrote a number of large-scale organ works, including one based on the very letters of Bach’s name, the Prelude and Fugue on BACH of 1855. The Fantasia and Fugue on the choral ‘Ad nos, ad salutarem undam’ dates from 1850, the centenary of Bach’s death. The title suggests a two-movement work such as Bach himself might have written, but this is really a vast, half-hour extemporisation on ‘Ad nos’, which is not a traditional chorale melody but one taken from the opera Le Prophète by Giacomo Meyerbeer (1791–1864), to whom the work is dedicated (and on this occasion the performance is immediately preceded by a playing-over of Meyerbeer’s theme). The turbulent opening bars of the work introduce passages of great excitement and virtuosity, including in particular a fanfare-like version of the chorale on a brilliant trumpet. For the contemplative Adagio, in which the organ’s quiet colours are extensively explored, the music moves from C minor to the remote key of F sharp major. A great climax prefaces the fugue, which begins strictly enough but soon acquires a free, rhapsodic quality. With ‘Ad nos’, organ music reached a plateau of heroic maturity on which it was subsequently joined by Liszt’s later works for organ, the massive chorale fantasias and other works of Max Reger (1873–1916), and works of such twentieth-century masters as Olivier Messiaen (1908–1992). From now on, organists were on a par with pianists and conductors; and the grand, C major statement of the chorale with which the work concludes may be taken as a celebration of the organist’s emancipation from the organ-loft and his acceptance as a concert as well as a church performer. Après des études à Stockholm, Copenhague, Chicago et New York, c’est à Stavanger, en Norvège, que l’organiste-compositeur Mons Leidvin Takle (né en 1942) a élu résidence. Puisant son inspiration dans le jazz, sa Blues-Toccata est élaborée presque entièrement sur un matériau thématique énoncé durant les quatre premières mesures, à savoir les quatre doubles croches brillantes à la main droite et les accords rythmiques énergiques (essentiellement des septièmes et des neuvièmes) dévolus à la main gauche et au pédalier. Il faut noter l’esprit particulièrement blues de l’alternance entre majeur et mineur des figurations de la main droite ainsi que des «breaks», semblables à ceux que connaissent les membres d’une formation jazz, du pédalier et de la main gauche qui reçoivent chacun leur part occasionelle de doubles croches. C’est pourtant la partie brillante de la main droite qui vole les feux de la rampe. La musique s’anime progressivement ; le pédalier s’élance dans une cadence concise et la conclusion ressemble à une échauffourée avec des septièmes de dominante de fa et sol majeurs énoncées simultanément sur un do tenu à l’octave au pédalier. Sous-titré «Nous marchons dans la lumière de Dieu», Siyahamba est élaboré sur un chant libertaire sud-africain. Il s’agit de la première des Three Global Songs de John A Behnke (né en 1953), professeur à l’Université de Concordia, de l’Etat du Wisconsin, aux Etats-Unis. Les accords répétés et parfois syncopés qui sont entendus au tout début introduisent «Stanza one» un premier énoncé joyeux du thème. Un «Interlude» conduit alors à un second énoncé plus robuste où le pédalier apparaît pour la première fois et le thème est ensuite déclamé solennellement dans le registre de trompette. Avec le second «Interlude», la musique se détourne brusquement de la solidité du sol majeur vers le scintillement de la tonalité éloignée de la majeur. Un passage similaire à celui énoncé précédemment introduit la «Stanza» finale, notée fortissimo et A bit slower, more majestic. Le retour d’accords réitérés donne l’impression que la musique évolue dans un crépuscule lointain. Et pourtant, le compositeur nous réserve une surprise. Organiste en l’Eglise Saint-Roch, à Paris et professeur d’orgue à l’Ecole Niedermeyer, Henri Mulet (1878–1967) fut l’une des personnalités les plus énigmatiques de la musique d’orgue française au point que son recueil Esquisses Byzantines publié en 1920 ne donnait aucun renseignement sur ses postes officiels. Au lieu d’être dédié à un collègue musicien, on peut y lire: «En mémoire de la Basilique du Sacré-Cœur de Montmartre 1914–1919». Tu es petra et portae inferi non praevalebunt adversus te («Tu es la pierre et les portes de l’enfer ne prévaudront pas contre toi») est la dixième et dernière pièce de ce recueil. Le titre est une corruption de la version Vulgate des mots prononcés par le Christ à Saint-Pierre dans le chapitre 16, verset 18 de l’Evangile selon Saint-Matthieu. Mulet décrit la pièce comme un carillon dans son édition séparée. Pourtant, il est préférable de la considérer comme un exemple caractéristique de toccata française pour orgue, avec ses figurations scintillantes aux manuels accompagnant des motifs d’allure sinistre au pédalier. Les dernières pages sont les plus saisissantes et excitantes de tout le répertoire pour orgue. Alleluija ! Alleluija ! Alleluija ! O Fils et Filles, chantons ! S’est élevé et a triomphé de la mort. L’œuvre fut créée par Ray et Beth Chenault qui en sont aussi les dédicataires, le 31 juillet 1983 en la Cathédrale nationale de Washington, aux Etats-Unis. Le titre que Rutter a retenu suggère un élément quelque peu liturgique, et pourtant cette musique dévoile de nombreux points communs avec les autres œuvres au programme de ce disque, en particulier ses figurations aux allures de toccata dans les variations les plus rapides et les harmonies «blues» des plus lentes. Les compositeurs d’œuvres pour orgue ont eu tendance à souligner les registrations les plus colorées de l’instrument. Bien entendu, on songe à la trompette depuis que les mouvements en Basse de trompette des messes françaises pour orgue et ceux des voluntaries de John Stanley et ses contemporains s’en sont fait les champions. Au milieu du XXe siècle, les sonorités plutôt douces des trompettes des orgues du XVIIIe siècles ont été dans une large mesure écartées par les exemples plus puissants. Norman Cocker et C S Lang firent partie des organistes-compositeurs anglais qui ont écrit des «mélodies de tuba»—des mouvements exploitant la sonorité imposante du registre le plus puissant de la famille des trompettes de l’orgue. C’est surtout pour son œuvre dans ce répertoire que l’on se souvient de David N Johnson (1922–1988), un compositeur américain qui écrivit prolifiquement pour l’orgue. La Trumpet Tune in G présentement enregistrée en est un exemple superbe. L’assurance et la majesté solennelles de sa musique, ses phrases d’une carrure de huit mesures, et les ornements occasionnels sont autant d’éléments redevables à la musique cérémonielle de la période baroque, le point de départ évident de Johnson. Pourtant l’usage d’une harmonie à notes ajoutées porte d’emblée le sceau d’un compositeur du XXe siècle. Dans cet enregistrement, on a retenu le registre de piston pour la section centrale en do majeur, ce qui accentue la reprise du registre de trompette. Comme Mulet, Maurice Duruflé (1902–1986) fut un organiste parisien, en charge de la tribune de Saint-Etienne-du-Mont de 1930 à sa mort. Né à Louviers, près de Paris, il se forma initialement à la Cathédrale de Rouen avant de se perfectionner au Conservatoire de Paris où il étudia la composition avec Paul Dukas à qui il dédia sa Suite opus 5 écrite autour de 1934. La Toccata, le troisième et dernier mouvement de la Suite, occupe une place à part dans cette œuvre comme dans le reste de la production restreinte mais particulièrement illustre de Duruflé. Elle ne reprend nullement la sombre beauté du premier mouvement, Prélude, ni la tranquillité exalté du second, une charmante Sicilienne. Si elle dévoile certains points communs avec Tu es petra de Mulet, elle explore plus en détail non seulement les ressources des grandes orgues mais aussi celles de la tonalité, de l’harmonie et des textures de la musique. En fait, la Toccata s’apparente plus étroitement au jeu pianistique de Ravel et de Debussy qu’aux traditions des tribunes françaises d’orgue, car dans les terrifiantes cascades de figurations virtuoses, on ne distingue aucune trace de chant grégorien, de polyphonie à la Bach. Si on note parfois un certain apaisement dans cet élan furieux, l’impression générale qui s’impose est celle d’une œuvre sombre et dérangeante en dépit de tout le brio dont elle fait preuve. On ne peut que se demander si derrière le refus éventuel de Duruflé à la jouer ou à l’enregistrer, il n’existerait pas à l’origine de sa composition une expérience personnelle profondément éprouvante pour son auteur. Joseph Bonnet (1884–1944) est le troisième organiste parisien au programme de ce disque. Né à Bordeaux, il entra au Conservatoire de Paris en 1901. Il y remporta les Premiers Prix d’orgue et d’improvisation en 1906, l’année où il fut nommé organiste de Saint-Eustache et de la Société des Concerts du Conservatoire. Il se produisit aussi beaucoup en récitals, abandonnant la tribune de son église pour entreprendre de nombreuses tournées. Matin Provençal est le deuxième de ses Poèmes d’Automne opus 3, un recueil de 1908. Dès le début, les douces figurations des flûtes suggèrent le jeu scintillant de la lumière à la surface de l’eau. Une mélodie modale exécutée au hautbois et élaborée sur le thème de la flûte campe un paysage rural. La mélodie de hautbois est amplifiée, exploitant les répétitions de notes dans sa première mesure; des notes chromatiques envahissent le calme modal. La musique s’anime de plus en plus et alors que le soleil atteint son zénith, les ressources de l’orgue sont toutes sollicitées. La mélodie du hautbois est énoncée Maestoso aux grandes orgues et l’évocation magique de Bonnet se conclut par la transformation des premières notes du thème de la flûte en une toccata suggérant que le soleil brûlant du midi a remplacé cette matinée d’automne. Formé à St John’s College, à Cambridge, où il fut «Organ scholar», Iain Farrington (né en 1977) fait partie des organistes-compositeurs les plus importants de sa génération. Celebration et Stride Dance sont respectivement les premier et troisième morceaux de Fiesta!, une suite pour orgue en sept mouvements. Ecrite en 2002 pour célébrer les soixante ans de Christopher Herrick, Celebration possède des allures de toccata s’inspirant de l’école française moderne de composition pour orgue. Elle dévoile un style rythmique époustouflant et une palette harmonique remarquablement riche. La tonalité de do majeur, suggérée en divers endroits est confirmée de manière saisissante par la dernière tenue et l’accord de sixte ajoutée qui conclut cette œuvre. Quelle que soit la personne en train de danser dans Stride Dance, elle ne peut qu’être une créature sinistre, sauvage qui hante les ombres ténébreuses de fa mineur. Les accords syncopés de la main droite occupent le premier plan tandis que le pédalier et la main droite n’offrent qu’un accompagnement hésitant à contre-temps. La musique progresse en assurance et intensité. Le motif initial en fa mineur apparaît sous divers atours majeurs ; mais c’est dans cette tonalité que l’œuvre se conclut sur une touche troublée, le dernier son comprenant les éléments de base de l’accord de tonique mais avec l’ajout de quarte, sixte et septième augmentées. C’est ainsi que le dixième volume des Feux d’artifice s’est concentré sur le répertoire des siècles actuel et précédent, en particulier sur les toccatas et compositions inspirées du jazz. Christopher Herrick conclut ce récital par une pièce écrite au XIXe siècle qu’il considère aussi comme la meilleure contribution à la littérature de l’orgue postérieure à Bach. Dans les années 1850, inspiré par l’intérêt porté à J S Bach, un trait caractéristique de la musique d’Europe centrale au XIXe siècle, Franz Liszt (1811–1886) écrivit un certain nombre d’œuvres importantes pour orgue, notamment en 1855, une composition élaborée sur l’équivalent musical des lettres BACH dans la nomenclature allemande, le Prélude et Fugue sur BACH. La Fantaisie et Fugue sur le choral «Ad nos, ad salutarem undam» date de 1850, l’année marquant le centenaire de la disparition de Bach. Le titre suggère une œuvre en deux mouvements, telle que Bach aurait lui-même pu l’écrire. En réalité il s’agit d’une immense improvisation sur «Ad nos» qui n’est pas une mélodie traditionnelle de choral, mais un thème tiré de l’opéra Le Prophète de Giacomo Meyerbeer (1791–1864), à qui cette œuvre est dédiée. (La présente exécution est précédée du thème original de Meyerbeer.) Les turbulentes premières mesures de l’œuvre présentent des passages palpitants et virtuoses, notamment une version aux allures de fanfare du choral dans un registre brillant de trompette. Pour l’Adagio contemplatif au cours duquel les coloris apaisés de l’orgue sont explorés à l’envi, la musique évolue de do mineur vers la tonalité éloignée de fa dièse mineur. Une immense apothéose préface la fugue qui débute dans une écriture stricte pour ensuite acquérir une qualité plus libre et rhapsodique. Avec «Ad nos», la musique pour orgue atteignait un sommet de maturité héroïque où allaient ensuite la rejoindre d’autres œuvres ultérieures pour orgue de Liszt, les massives fantaisies-chorals et autres compositions de Max Reger (1873–1916), et des pages de grands maîtres du XXe siècle comme Olivier Messiaen (1908–1992). Dès cet instant, les organistes se trouvèrent placés sur un pied d’égalité avec les pianistes et les chefs d’orchestre. Le grand énoncé en do majeur du choral par lequel cette œuvre prend fin doit être perçu comme une célébration de l’émancipation de l’organiste, libéré de la tribune de l’orgue, et de son acceptation comme concertiste au même titre que musicien d’église. Der Organist und Komponist Mons Leidvin Takle (geb. 1942) studierte in Stockholm, Kopenhagen, Chicago und New York und wohnt heute im norwegischen Stavanger. Seine vom Jazz inspirierte Blues-Toccata fußt fast vollständig auf dem Material der ersten vier Takte: brillante Sechzehntel in der rechten Hand und schwungvolle, rhythmische Akkorde (vorwiegend mit Septimen und Nonen) in der linken Hand und in der Pedalstimme. Besonders bluesartig ist die Art und Weise, auf die die rechte Hand zwischen Dur und Moll hin- und herwechselt. Ebenso wie die Mitglieder eines Jazz-Ensembles immer wieder Soloeinlagen haben, so haben die linke Hand und das Pedal auch einige Sechzehntelpassagen zu spielen, jedoch stiehlt der brillante Part der rechten Hand trotzdem die Show. Die Lebhaftigkeit nimmt immer mehr zu, in der Pedalstimme erklingt eine kurze Kadenz und das Stück endet mit furiosen Dominantseptakkorden in F-Dur und G-Dur, die gleichzeitig über einem oktavierten C im Pedal ausgehalten werden. Siyahamba trägt den Untertitel „We are marching in the light of God“ [Wir marschieren in Gottes Licht] und basiert auf einem südafrikanischen Freiheitslied. Es ist das erste der Three Global Songs [Drei Weltenlieder] von John A. Behnke (geb. 1953), Professor an der Concordia Universität in Wisconsin, USA. Die wiederholten und zuweilen synkopierten Akkorde, die am Anfang erklingen, leiten die erste Strophe [„Stanza One“] ein: eine schwungvolle erste Darbietung des Themas. Ein Zwischenspiel [„Interlude“] führt dann zu einer weiteren, kraftvolleren Äußerung des Themas hinüber, wobei die Pedalstimme zum ersten Mal zu hören ist und das Thema mit einem edlen Trompetenregister erklingt. Beim zweiten Zwischenspiel wechselt die Musik recht abrupt von dem soliden G-Dur zu der entfernten Tonart A-Dur. Die letzte Strophe ist mit fortissimo und A bit slower, more majestic [Etwas langsamer, majestätischer] überschrieben und wird von einer Passage eingeleitet, die an den Anfang erinnert. Die Rückkehr der Akkordrepetitionen lässt den Hörer vermuten, dass sich die Musik tanzend entfernt, jedoch sorgt der Komponist am Ende für eine Überraschung. Henri Mulet (1878–1967) war Organist an der Pariser Kirche St. Roch und Professor für Orgel an der École Niedermeyer. Er gehört zu den rätselhafteren Figuren der französischen Orgelmusik; sein Zyklus Esquisses Byzantines [Byzantinische Skizzen], erschienen 1920, etwa enthält keinerlei Hinweis auf seine Posten und statt einer Widmung findet sich folgende Inschrift: „En mémoire de la Basilique du Sacré-Coeur de Montmartre 1914–1919“ [In Erinnerung an die Basilika Sacré-Coeur von Montmartre 1914–1919]. Tu es petra et portae inferi non praevalebunt adversus te [Du bist der Fels und die Pforten der Hölle werden Dich nicht bezwingen können] ist das zehnte und letzte Stück dieses Zyklus’ und der Titel ist eine Korrumpierung der Vulgata-Version der Worte Christi an Petrus nach dem Matthäus-Evangelium, Kapitel 16, Vers 18 (eigentlich müsste es „Tu es petrus“ heißen, da es aber an die Basilika gerichtet ist, wurde die feminine Form verwendet, Anm. d. Ü.). In der Einzelausgabe beschrieb Mulet das Stück als carillon [Glockenläuten], es ist jedoch passender, es als eine recht typische französische Orgeltoccata aufzufassen, in der die funkelnden Figurationen in den Manualen die finster klingenden Motive in der Pedalstimme begleiten. Die letzten Seiten gehören zu den aufregendsten im Repertoire für Orgel. O Söhne und Töchter, lasst uns singen! Hat sich heute triumphierend über den Tod erhoben. Das Werk wurde von seinen beiden Widmungsträgern Ray und Beth Chenault am 31. Juli 1983 in der National Cathedral von Washington in den USA uraufgeführt. Obwohl der Rutters Titel auf ein kirchliches Stück schließen lässt, weist das Werk doch eine große Affinität zu den anderen Stücken der vorliegenden CD auf, insbesondere was die Toccata-artigen Figurationen der schnelleren Variationen und die bluesartigen Harmonien der langsamen Variationen anbelangt. Die Komponisten der Orgelmusik haben schon immer die farbenreichen Register des Instruments hervorgehoben und natürlich besonders das Trompetenregister, das seit den Basse de Trompette-Sätzen in den französischen Orgelmessen und den entsprechenden Sätzen der Orgelstücke von John Stanley und seinen Zeitgenossen zum Einsatz kam. Im 20. Jahrhundert wurden dann die eher leisen Trompetenregister des 18. Jahrhunderts größtenteils durch Hochdruckregister beiseite geschoben. Norman Cocker und C. S. Lang etwa gehörten zu den britischen Organisten und Komponisten, die „Tuba-Melodien“ schrieben: Sätze, in denen die enorme Klangbreite der kräftigsten Trompetenstimme der Orgel zum Ausdruck kam. David N. Johnson (1922–1988), ein amerikanischer Komponist, der sehr viel für die Orgel schrieb, ist heutzutage hauptsächlich bekannt eben für seine Beiträge zu diesem Repertoire. Das vorliegende Werk, Trumpet Tune in G [Trompetenmelodie in G], ist ein gutes Beispiel dafür. Die Würde und das stolzierende Moment dieser Musik, die aus achttaktigen Phrasen bestehende Struktur und die gelegentlichen Ornamente gehen alle auf die zeremonielle Musik des Barock zurück, die offensichtlich der Ausgangspunkt für Johnson war; jedoch verraten die Harmonien mit ihren hinzugefügten Tönen sofort die Feder eines Komponisten des 20. Jahrhunderts. Für die vorliegende Aufnahme wurde für den Mittelteil in C-Dur eine Zink-Registrierung verwendet, die die Rückkehr des Trompetenregisters umso wirkungsvoller macht. Ebenso wie Mulet war auch Maurice Duruflé (1902–1986) ein Pariser Organist, der in St. Etienne-du-Mont von 1930 bis zu seinem Tode wirkte. Er wurde in Louviers in der Nähe von Paris geboren und begann seine Ausbildung an der Kathedrale von Rouen. Später studierte er Komposition bei Paul Dukas am Pariser Conservatoire und ihm widmete er auch seine Suite, op. 5, die etwa 1934 entstand. Die Toccata, der dritte und letzte Satz der Suite, unterscheidet sich im Stil sehr von den vorangehenden Sätzen und auch von Duruflés restlichem kleinen, aber erstklassigen Oeuvre. Weder ist hier die triste Schönheit des Prélude (der erste Satz) noch die exaltierte Friedlichkeit der Sicilienne (der zweite Satz) anzutreffen. Und obwohl der Satz mit Mulets Tu es petra einiges gemeinsam hat, werden nicht nur die Mittel einer großen Orgel, sondern auch die tonalen, strukturellen und harmonischen Möglichkeiten der Musik erkundet. Tatsächlich ist dieser Satz der Klaviermusik Ravels und Debussys viel verwandter als der französischen Orgelmusik, da in der angsteinflößenden Kaskade von virtuosen Figurationen keinerlei Spur von Gregorianischem Choral oder Bachscher Polyphonie zu finden ist. An mehreren Stellen beruhigt sich die Musik etwas, jedoch ist das Werk insgesamt aufgrund seiner Brillanz düster und beunruhigend und man fragt sich, ob Duruflé es aufgrund einer verhängnisvollen persönlichen Erfahrung weder spielen noch aufnehmen wollte. Joseph Bonnet (1884–1944) ist der dritte Pariser Organist dieser CD. Er wurde in Bordeaux geboren, begann sein Studium am Pariser Conservatoire im Jahre 1901 und gewann 1906 den Premier Prix für Orgel und Improvisation. In demselben Jahr wurde er zum Organisten von Saint-Eustache und von der Société des Concerts du Conservatoire ernannt. Zudem unternahm er viele Konzertreisen auf denen er Recitals gab. Das vorliegende Werk, Matin Provençal [Provenzalischer Morgen], ist das zweite Stück seiner Poèmes d’Automne [Herbstgedichte], op. 3, ein Zyklus, der etwa 1908 entstand. Zu Beginn wird durch eine sanfte Tonfolge im Flötenregister ein Lichtspiel auf der Wasseroberfläche angedeutet und eine modale Melodie, die im Oboenregister gespielt wird und auf einer Flötenweise fußt, stellt eine ländliche Szene dar. Die Oboenmelodie wird weiterentwickelt, wobei die Tonrepetitionen des ersten Taktes besonders zum Einsatz kommen. Die modale Ruhe wird dann durch chromatische Noten zerstört, die Musik wird immer lebhafter und wenn die Sonne ihren Zenit erreicht, werden die verschiedenen Möglichkeiten der Orgel allmählich eingeführt. Die Oboenmelodie erscheint als Maestoso im vollen Orgelklang und Bonnets zauberhaftes Bild endet mit einer umgestalteten Version des Anfangs: es erklingt eine Toccata, die das Ende eines Vormittags darstellt, der sich in glühende Mittagshitze verwandelt. Iain Farrington (geb. 1977) war am St. John’s College in Cambridge als Organ Scholar (ein Student, dem ein Stipendium mit der Bedingung verliehen worden ist, dass er dem Director of Music assistiert und in der Kapelle des Colleges Orgel spielt, Anm. d. Ü.) tätig und gehört zu den führenden komponierenden Organisten seiner Generation. Celebration [Feier] und Stride Dance [Schritt-Tanz] sind jeweils die erste und dritte Nummer seiner siebensätzigen Orgelsuite Fiesta!. Celebration entstand 2002 anlässlich des 60. Geburtstages von Christopher Herrick und ist ein lebhaftes, Toccata-artiges Werk, das sich an die moderne französische Schule der Orgelkomposition anlehnt und sich durch einen blendenden rhythmischen Stil sowie durch eine bemerkenswert reiche harmonische Palette auszeichnet. Die Tonart C-Dur wird an mehreren Stellen angedeutet und gegen Ende durch Pedalnoten und den Schlussakkord mit hinzugefügter Sexte auf erregende Weise bestätigt. Wer auch der Tänzer des Stride Dance sein mag, es ist jedenfalls eine unheimliche, wilde Kreatur, die in dem düsteren Schatten des f-Moll umherschleicht. Die synkopierten Akkorde in der rechten Hand spielen dabei die Hauptrolle und das Pedal und die linke Hand sorgen für eine zögerliche, leicht synkopierte Begleitung. Die Zuversicht und Intensität der Musik nehmen zu und die Anfangsfigur in f-Moll erscheint in verschiedenen Dur-Masken; jedoch endet das Stück auf sehr beunruhigende Weise mit einem Schlussakkord, der zwar die Grundzutaten einer Tonika aufweist, dem jedoch ein Tritonus sowie eine Sexte und Septime hinzugefügt sind. Soweit lag der Akzent dieser 10. CD der Reihe Orgelfeuerwerke auf der Musik des 20. und 21. Jahrhunderts, insbesondere auf Toccaten und vom Jazz inspirierten Werken. Christopher Herrick schließt mit einem Werk, das im 19. Jahrhundert entstanden ist und das er als das beste Orgelstück nach Bach betrachtet. In den 50er Jahren des 19. Jahrhunderts schrieb Franz Liszt (1811–1886), inspiriert durch das Interesse an Bach, dass die Musik des 19. Jahrhunderts besonders prägte, mehrere große Orgelwerke, darunter eines, das auf den Buchstaben von Bachs Namen basiert: Präludium und Fuge über B-A-C-H (1855). Die Fantasia und Fuge über den Choral „Ad nos, ad salutarem undam“ [Zu uns, zur heilbringenden Woge] stammt aus dem Jahre 1850, dem hundertsten Todesjahr Bachs. Der Titel lässt ein zweiteiliges Werk vermuten, wie Bach es selbst hätte schreiben können, jedoch handelt es sich um eine riesige, halbstündige Improvisation über „Ad nos“, das keine traditionelle Choralmelodie ist, sondern aus der Oper Le Prophète von Giacomo Meyerbeer (1791–1864) stammt, dem das Werk auch gewidmet ist (und hier erklingt das Meyerbeersche Thema unmittelbar vor der Komposition Liszts). Die turbulenten Anfangstakte des Werks leiten ungeheuer aufregende und virtuose Passagen ein, darunter eine fanfarenartige Fassung des Chorals in einem brillanten Trompetenregister. In dem kontemplativen Adagio werden die ruhigen Farben der Orgel dargestellt und die Musik bewegt sich von c-Moll zu der entfernten Tonart Fis-Dur. Ein großer Höhepunkt geht der Fuge voran, die zwar sehr streng beginnt, sich bald jedoch eine rhapsodische Freiheit aneignet. Mit „Ad nos“ erreichte die Orgelmusik ein Plateau heroischer Reife, auf das sich später auch weitere Orgelwerke Liszts, die riesigen Choralfantasien und andere Werke von Max Reger (1873–1916) sowie Werke von Meistern des 20. Jahrhunderts wie etwa Olivier Messiaen (1908–1992) begaben. Von nun an konnten sich die Organisten mit Pianisten und Dirigenten messen und die großartige Darbietung des Chorals in C-Dur, mit der das Werk endet, mag als Emanzipationsakt gelten, mit dem sich der Organist von der Orgelempore löst und fortan als Ausführender im Konzert ebenso wie in der Kirche als selbstverständlich gilt. When the Francis Winspear Centre for Music was opened in 1997, it was acclaimed as one of the finest concert halls in the world. Orgues Létourneau, arguably the foremost organ builder in Canada today, had already been selected to design and build a large pipe organ for the hall on the understanding that a contract would be signed when the funds became available. By June 2000 the fund-raising efforts were still far from the targeted amount and the organ project seemed to have stalled indefinitely. All that changed when Dr Stuart Davis, a retired university professor and patron of the Edmonton Symphony Orchestra, made an unannounced visit to the hall to ask if he might make a donation towards a pipe organ. Dr Davis was pleased to discover that plans were already in place for such an instrument and that his gift of two million Canadian dollars would allow work to begin on the organ immediately. Dedicated to the memory of Dr Davis’ late wife Winona, it became known as the Davis Pipe Organ. It was inaugurated in September 2002 as Létourneau’s opus 50, a designation that had been reserved for it since the early days of the project. Christopher Herrick gave the first solo recital at that time and immediately fell in love both with the instrument and the hall. There is a four-manual console on a moveable platform at stage level for solo recitals and performances with orchestra. An identical console, attached to the casework above the stage, provides for practice or informal demonstration. It has electric slider key action and the stop action is solid-state with a full memory system. There are four manuals, with the en chamade trumpets available independently on three of the manuals and the pedals. Four separate tremblants (tremulants) affect three manuals as well as the higher pitched stops in the pedals. The façade pipes are from the Pédale Montre 32' and the Grand-Orgue Montre 16'.